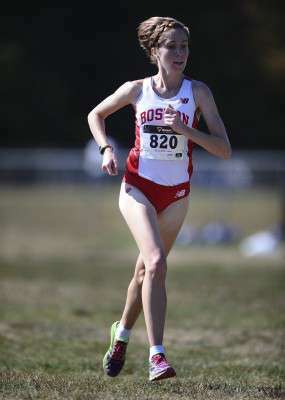 The Boston University women’s and men’s cross country teams put up strong performances at the Patriot League Championships at Lehigh University Saturday, with the women’s team winning the conference for the second straight year. The BU women tied Bucknell University with 52 points, but prevailed on a tiebreaker. In the Patriot League, when there is a tie between two teams, each of those team’s top three runners are compared head-to-head. In this case, the Terriers’ top-three runners each finished before the Bison’s top-three runners. The Terriers were led once again by senior Rosa Moriello, who finished first individually for the second year in a row. She completed the 6,000-meter race in 20:18.1, just 12 seconds faster than second-place runner sophomore Elizabeth Weiler of Lehigh University. Moriello’s efforts, including a strong showing throughout this season, earned her the honor of being named Patriot League Runner of the Year. Rounding out the top three for the Terriers were sophomore Sarah Saccoach (21:15.3) finishing in sixth place and junior Shelby Stableford (21:21.2), crossing the finish line in ninth. Junior Michelle Sumner finished 16th with a time of 21:35.2, and sophomore Hallie Armstrong’s time of 21:44.2 gave her 20th place to finish fifth for the Terriers and inch out Bucknell for the title. Also running strong races for the Terriers were junior Rachel Lotterman (22:06.0) in 33rd, freshman Alex Osman (22:23.4) in 50th and junior Erin Pierce (22:35.1) in 55th. The men’s team also ran well, as the team’s efforts ended up resulting in a fourth-place overall finish. The Terriers had three runners place in the top 20 to give them 97 points. The United States Naval Academy won the meet with 30 points. BU was led by junior Alec Olson, who finished in 12th with a time of 24:27.1. Fellow junior Kevin Thomas crossed the finish line in 24:30.3, securing 15th place, followed by senior Ben Ravetz (24:39.4) finishing in 20th. Rounding out the top five were sophomore Mitchell Russo (24:58.2) in 27th and junior Paul Gennaro (24:58.4) in 28th. Sophomore Matti Groll (25:37.2), senior Alex Civitano (25:49.0) and sophomore Ethan Homan (26.10.0) also ran well for the men’s team. Both the women’s and men’s teams will travel to New York to compete in the NCAA Northeast Regional Championships on Nov. 14. The top two teams and top two individuals at the meet receive an automatic berth to the NCAA Championships. The Terriers will be looking to better their performance from last season, where the men’s team finished 17th overall at the meet and the women’s team earned a 14th place finish.